What makes this one special is that this will be the last ride on Wilshire Boulevard until the above-ground street construction for the Metro Purple Line subway extension through the Miracle Mile is completed. 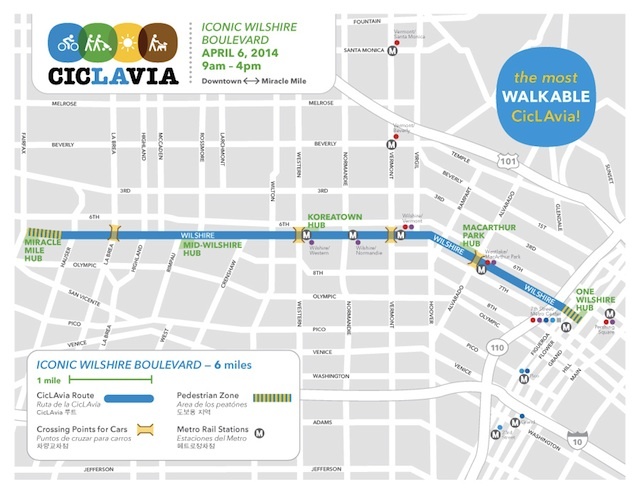 Robert Gard, spokesperson for CicLAvia tells LAist, that could take a few years. While you&apos;re at it, you can also get some architectural history in you during the ride. Participants will get to listen to a podcast about the street&apos;s architecture from researcher Edward Lifson and follow an architectural walking guide written by Catherine Gudis, according to a statement from CicLAvia. But if you&apos;d like to get a head start before your ride, check out this awesome Wilshire Boulevard guide written last year by LA Observed&apos;s Kevin Roderick, who actually wrote a book on the history of this iconic street.